Regulating gas distribution pressure may be done through locally installed pressure regulators, particularly for low and small flow values. However, when the pressure and flow values are much higher we can use balanced pressure regulators. The models produced by GNALI BOCIA are spring loaded and diaphragm controlled. The plug is balanced and this enables regulating pressure even with a wide range of inlet pressures. Their use is possible with all non-corrosive types of gas and their quick response makes them the ideal solution for civil or industrial settings, particularly for boilers, burners and industrial furnaces. The catalogue presents two pressure regulator models, code FG100 which accepts an input from 0.5 to 20 bar according to the versions. Regulation is according to the customer’s request. This model is available with minimum and maximum pressure stop valves. 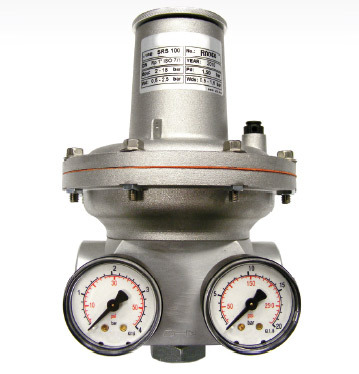 The other pressure regulator model with anti-freeze characteristics is the BHP100, specifically designed for natural gas and LPG. Both models are constructed in die-cast aluminium on latest generation machines in order to ensure precision, durability and safety. 04/07/2014 Choose pressure regulators to fit your installation The range of pressure regulators in our catalog enables you to choose the most suitable model.